So, as most of you know, I am normally a one-event-a-day kind of girl. Today there were three. We started off with Jasper’s Bible Quiz. It has been hard getting him to study the past two weeks and it showed. He did get a silver medal and the opportunity to advance to the next level. He and I both went to the quiz in Renaissance Faire garb and talked up the faire to everyone who commented. After the quiz was over we got in the car and drove straight to the faire (well, after getting gas in the car). It couldn’t have been a more perfect day. Bright, sunny, breezy and not humid. Everything just seemed to glow. Flynn and Lucy were already there, so we met up and had lunch. The kids spent the rest of the afternoon entertaining themselves at the faire while I got to work doing more interviews. As always, it was fascinating. So many interesting people and amazing items for sale. I left before the kids so I could get back and help with the chai party. However, thanks to the fact that I stopped for a drink and then had to go shopping for chai party cups, so the kids actually got home before me! It wasn’t a big party, but I think the people who came enjoyed it. Flynn spent most of the evening helping Mercy with her algebra. He’s a good brother. And now my hands are kind of scalded because someone requested rice cakes for breakfast tomorrow. It Rained on Friday Instead of Saturday! Lucy was still sick today, so we had to cancel our Biology class. I still had to go tutor, however, and I ended up staying for quite a while to visit with Robin afterwards. After all the cold weather we’ve had, today was hot and muggy, with temperatures reaching 84°. So I had a taste of how much fun it’s going to be again to not have an air-conditioned vehicle this summer. Then Mercy wanted me to take her to Walmart at about supper time, and a few moments after we walked in the door a massive thunderstorm hit. The power actually went out in the store! Only for a few moments a couple of times, but it’s still rather unsettling when you’re in a big place like Walmart. Then I got to load all the groceries into the car in the pouring rain. Not my favorite thing. Today was lasagna day, which is not a happy day for me anymore, because I can’t have lasagna. It was kind of depressing to make the regular lasagna and the gluten-free lasagna and then just eat a salad! One thing I did today was go through the chapter I had submitted to my critique group and revise it. They had great suggestions and I am so grateful. I believe it is much better now. Next I need to revise the following chapter and see if I can forestall some of the same comments next time! Tomorrow: a quiz, a faire, and a chai party. Taking a deep breath . . . Sorry about last night’s silence. My family comes first, and last night that kept me from posting. The primary feature of today was the fact that Jasper and I went to the park for about an hour of park day. It has been many weeks since we did this, to the point that I feel like a complete outsider now. I am so ready for the formal semester to be over so that we have more flexibility in our schedules. Also today, Jasper listened to almost the entire book of Genesis as an audiobook. This Saturday he has his next quiz, and it will be over the entire book. We are studying the official questions, of course, but I thought it would be good for him to have the whole book fresh in his mind. He was enthralled! He wants me to get some other books of the Bible as audiobooks also. I think I can swing that. I started a new knitting project. I hated not having a compact project to take to the Faire. Not that I have time to knit at the Faire these days. I am mostly working–doing interviews so that I can come home and write them up. But still . . . you never know! I am also working on a very long post but it’s not done yet. I’ll give you fair warning so you can avoid it when I finally post it! It’s always surprising to me how exhausting pain can be. Today I woke up with a monster headache and didn’t really get much relief at all until late afternoon. However, I still had to go grocery shopping at Walmart and prepare for and teach a class. By the time I finished with my class, I was very weary, not to mention a little shaky from all the caffeine I drank to help the meds along! But I still had to go to meet with my new critique group. That is my big news. I have known for a couple of years that I really needed to get into a critique group, but I didn’t know how to go about finding one! You can imagine my delight when I was actually invited to join one by my local writers’ group leader, a woman whom I greatly admire and respect. At the same time, I was pretty nervous. First of all, my own critiquing skills are, well, nonexistent. Secondly, I worried that other writers would read my work and laugh hysterically at the idea of my ever becoming published. What actually happened, of course, was that the other two ladies who were there tonight provided some very helpful feedback. Getting good critique is like having the blinders removed from your eyes so that you can see the flaws in your own work–which is a really good thing because of course you can’t improve your work if you can’t see what’s wrong with it. By the time we got to the actual meeting after the critique session, I was finding it very hard to focus. My eyes might have closed more than once. I was really glad to get home and doze in my chair for a while before tackling more class preparation. Can’t wait for bedtime . . .
Well, I caved. Lucy twisted my arm and I ended up taking her and her friend Emma back out to the Faire yesterday after church. When we left home, it was relatively warm so I wore a short-sleeved blouse but took a shawl “just in case.” The weather forecast in the morning had said there was only a 10% chance of rain. Well, guess what? By the time we reached the Faire it was cold and windy. Then it started drizzling. I had to send Lucy to the car for my umbrella! I was cold all afternoon though, and tried very hard to be thankful for it because the day is soon coming when I will dream longingly of being cold. I only did 2 interviews because I wanted to get to do something other than work! 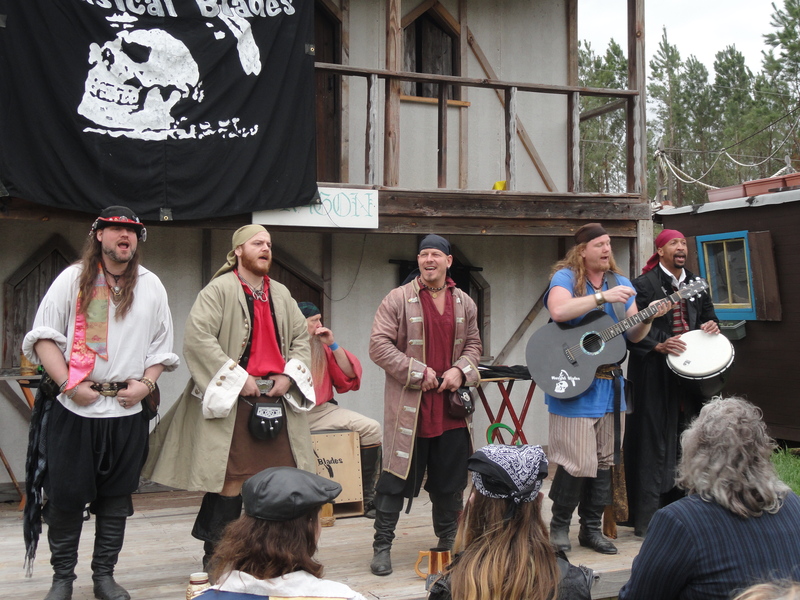 I hung out at the forge for a while, listened to some music in the tavern and sat through two full shows of the Musical Blades, our special pirate guests for the weekend. If you ever get a chance to hear them, go! They are a lot of fun and so full of energy! Plus they can actually sing and their drummer is amazing. They had all of us joining in and stomping our feet and clapping our hands. We ended up sitting on wet benches and watching Elliot’s juggling show before heading back to the car to warm up and drive home. I still had a lot to do after we got here. This morning I took the kids up to meet my friend Joan, who took them with some other 4-H kids on a field trip to the “fancy” grocery store in Tyler, where they learned about nutrition and cheese making. Meanwhile, I was able to get some work done here. After the kids returned, I took Lucy to the library to get books for her research paper. I practically had to push her out the door, but once we got to the library, she ended up getting the limit of 10 books! I somehow have the feeling that her notes won’t be finished in time . . .
PS: Sorry for the strange formatting. WordPress appears to be asleep. Today was a big day, the day of the “official” celebration of Lucy’s 16th birthday. 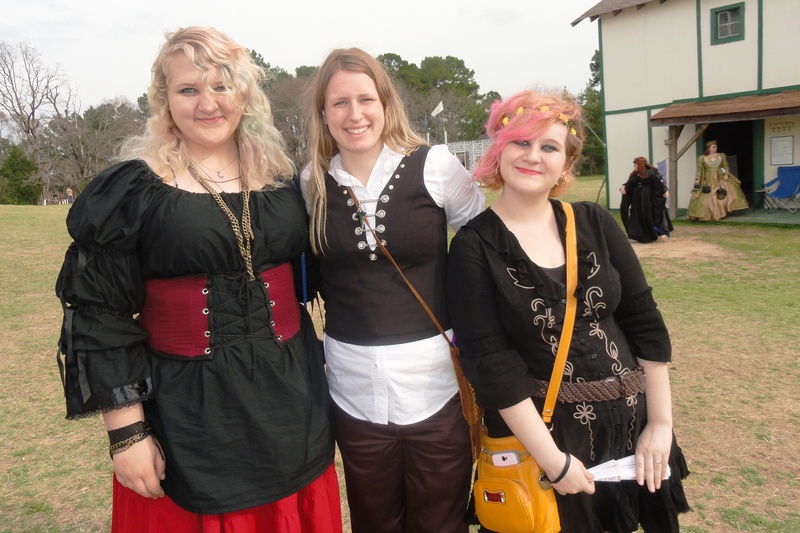 She had invited two of her friends to come to the Faire with us, and I had also invited one of Mercy’s friends from church who had never been. Despite all the preparations last night, and despite getting up an hour earlier than I wanted to this morning, we still left half an hour later than I had intended. It was foggy and misty as we drove to the Faire, and I had to keep my windshield wipers going. However, we were all in high spirits! On the way there, I realized that I had forgotten to bring the bread for our sandwiches. (It is easy for me to forget bread since I can’t eat it anymore.) So we had to stop to buy some. When we arrived, my friend Angela and her husband were waiting in the parking lot for me. Angela had won a pair of Faire tickets on Facebook, and I had them with me, so she couldn’t get into the Faire until I got there. I very rarely cross paths with her these days, because she lives quite far away, so it was good to see her. The girls were mostly on their own for the day, as I needed to get as many interviews done as possible. I interviewed some people I have been watching or talking to for years, and learned all kinds of new stuff. It was so fascinating! One of the people I interviewed was a young performer who came for the first time last year. 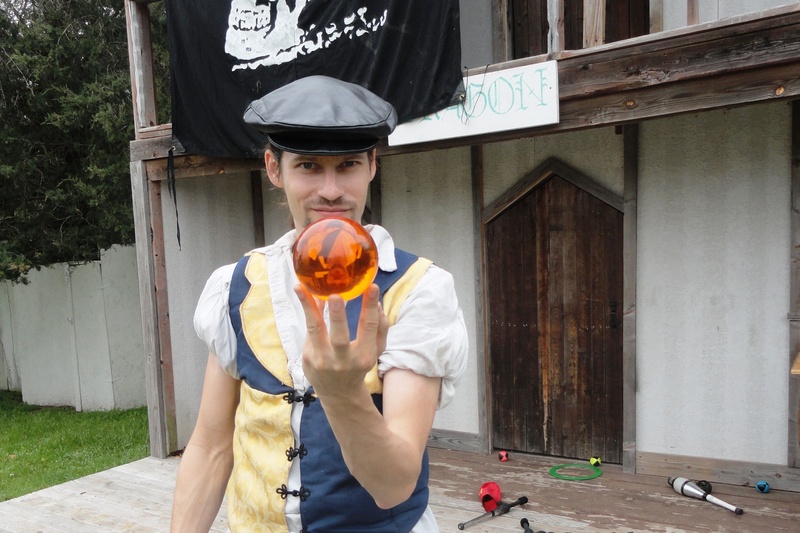 He does juggling and magic and has a great rapport with the audience. As we were wrapping up our conversation, Lucy and her friends came wanting the car keys. It seems Haley had been wearing high-heeled boots which were very attractive, but they were also so painful that she took them off and planned to spend the rest of the day in socks. Elliot, the guy I was interviewing, immediately offered to loan Haley some sneakers he had that he thought might fit her–and they did! How often does a performer offer to loan his shoes to a complete stranger who just happens to be a patron at the Faire? We rendezvoused for lunch at the car before heading back in for the first joust. The joust this year has been truncated, pared down from the way they’ve done it in the past, and I confess I have been quite dismayed about this. 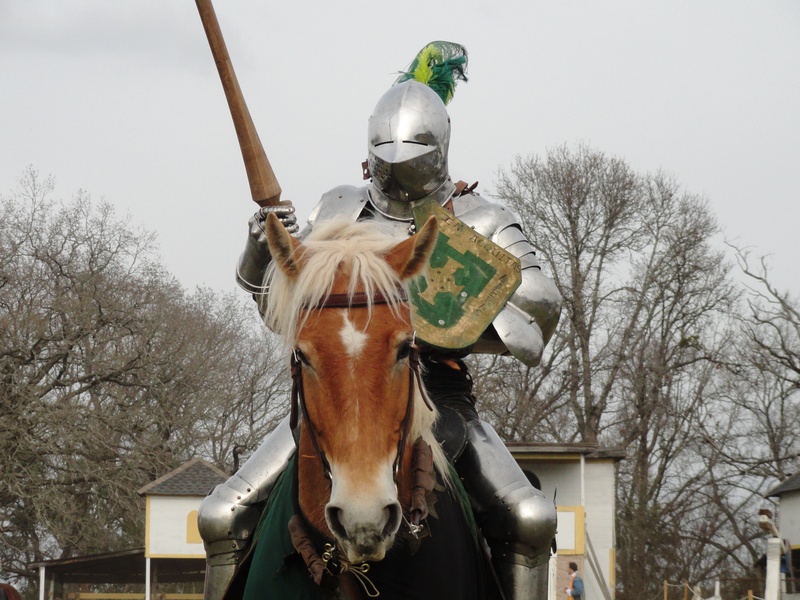 I also realize that not everyone finds jousting as fascinating as I do, and that the knights have to do what they can to keep crowds interested. I miss the “old” days, though! I kept busy with more interviews after the joust, and then rounded the girls up to see if they wanted to try going to the Queen’s Tea with me. By then one of the girls had been picked up by her parents, so there were just four of us. Every year I have thought about going to the Queen’s Tea, and up until now I always opted for a mango smoothie instead. Of course now the mango smoothies are no more, so the tea seemed more attractive. The girls agreed to come with me, so we made our way to the “castle” which is very nicely decorated inside and had tables and chairs set up. It ended up being my favorite thing about a day that was full of good things. There was some tomfoolery related to the fact that this is the “pirate invasion” weekend. There were songs sung by various performers and enthusiastic audience participation. There was real tea served in real teacups, and a tower of delicious delicacies. It was a wonderfully pleasant respite, and it was also fun. I made a second visit to the forge in the afternoon, to look for the girls and to get a photo of Master Shadowhawk and his lady. And when I mentioned that we were celebrating Lucy’s birthday, they gave me a beautiful purple hairstick as a birthday present for her! That was so sweet. Lucy loves purple. I did a final interview after the evening joust, and then visited with Triskelion (a singing group) until time came to meet the girls at the car for the drive home. No one wanted to leave. I think everyone had a good day, and we still had supper and birthday cake waiting for us at home, and Haley is spending the night. Lucy is already begging to go again tomorrow. Begging, I tell you. I have a confession to make. Not that I don’t regularly confess my own stupidity and other shortcomings here, of course, but this is something I’ve never confessed before and I kind of don’t want to confess it now, because you’ll think less of me, but on the other hand today’s accomplishments would mean nothing if you didn’t know what I’m about to tell you. Like lots of other people, I generally fear and loathe bureaucracy in all its forms. I don’t mind you knowing that. What I hate to admit is that I’ve been living in absolute terror for a couple of years over something that is really so trivial. For the last three years at least I have offered to put up posters about the Renaissance Faire at the university where Walter works. The first year I got Walter to inquire about it, and he was told that the posters were unacceptable because there was one little part of the collage that depicted a belly dancer. After that he washed his hands of the whole idea. Last year, I offered again to do it, and to cover up the offending image with a manly jousting photo, but I was off the hook in the end because I didn’t actually receive the posters. 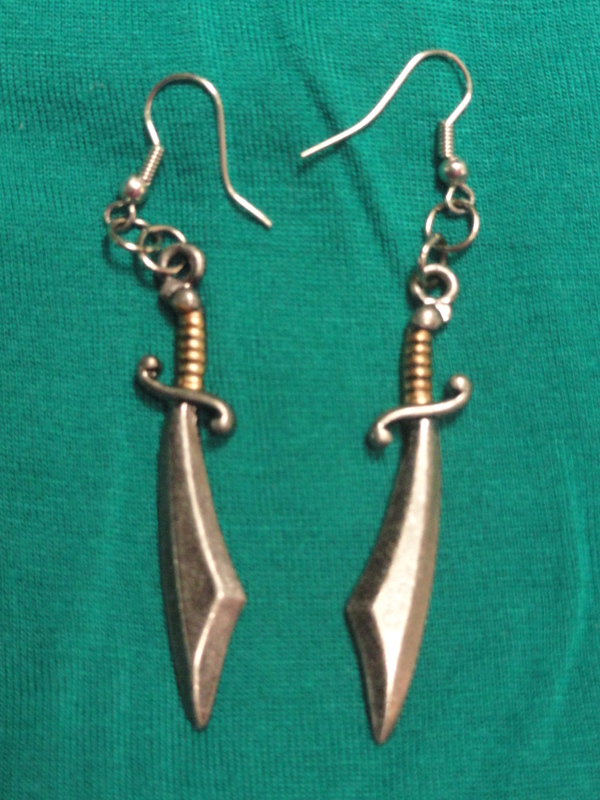 As this year’s faire approached, I found myself deeply conflicted. On the one hand, I really, really want to help the faire in any way I can, and I also think the college students would greatly enjoy the faire. On the other hand, every single time in the last three years that I’ve mentioned my desire to put posters up on campus, I’ve been reminded by everyone in earshot that I have to get the posters “approved” and “stamped.” Every. Single. Time. First of all, I think this says something about my family’s assessment of my memory, which admittedly is not what it once was. Secondly, the relentless repetition of the warnings led me to believe that getting that coveted stamp of approval was only slightly less difficult than running a triathlon while handcuffed to a millstone. Every time I thought about going to the university and finding the right office and confronting the right person, I found myself inwardly quivering. So, it’s no wonder that when I finally got the posters, and got them all ready with pockets to hold the coupons, that I couldn’t seem to make myself go over there. I cravenly dodged the issue by asking some of our chai party kids to do it, but I didn’t get a single offer of help. Then I kind of backed myself into a corner by promising that I would do it this week, and because I normally keep my word, I found myself out of options because there’s no way on earth that I would go to the faire tomorrow and admit that the posters were still not up. Yesterday was the day I was going to do it, but what with the lunch at the church and the play I was short on time and very, very short on courage. That left only this morning, because we had Biology in the afternoon. I got up early and did my shopping and then came home and had breakfast, but after that I was out of excuses and would soon be out of time if I didn’t do something. I had asked my husband who I had to see and where her office was, so I even knew where to go. The one thing that gave me hope was that the lady I needed to see was in fact the mother of one of my former students, and though I hadn’t met her in person I had exchanged emails with her and I am very fond of her son. So, I drove to the campus and braved the intimidating brand-new student center, and found the right office. The lady was friendly and sympathetic, but it turned out there was an issue with the posters that I hadn’t thought about. She had to consult a superior while I waited anxiously in the foyer. The longer I waited, the more certain I was that my mission had failed. You can imagine my incredulity when she returned and said that the posters could be approved after all. Not only that, but I did not have to even do it myself. Student workers would put them up for me. And not only that, but they would put up the Highland Games flyers in addition to the regular Faire posters. I was so stunned I’m sure I just gaped like a fish. By the time I got to the elevator I had a powerful urge to dance, but I was pretty sure there was a security camera in there somewhere so I just danced in my head. After three years of anxiety, it was incredible to realize that my fears had been ungrounded. After that I drove to the post office and mailed a package that I had been putting off for a week or two, and picked up a package that the mail carrier had tried to deliver during the five minutes this week that no one was home. Either that or he tried to ring the doorbell. Our front doorbell doesn’t work even a little bit so if he tried to ring the doorbell, he wouldn’t get an answer even if the house was full to bursting with people. By the time I arrived back home I was feeling pretty happy about life in general. After lunch we drove up for Biology, or, as I like to think of it, “Linda’s nap time.” I am always so sleepy and I always fall asleep on Kim’s couch while the girls are having their Biology lesson. We stopped at the health food store on the way home and then tackled the task of making not one, not two, but three kinds of pizza for supper. There was “normal” pizza for Walter and Jasper (Spencer is in another town for a tennis tournament and Mercy had a seminar to go to). There was gluten-free pizza for Lucy. And there was everything-free pizza for me. A gluten-free crust with dairy-free “cheese” that looked more like bits of straw. Fortunately I no longer can really compare the stuff I eat to the “real” version, so the gluten-free dairy-free pizza wasn’t as bad as I expected. After making a makeshift brown sugar/vanilla cake last night, I got up this morning and made icing for it, along with a batch of gluten-free cornbread. I wanted to make sure Lucy and I would have something to eat! Spencer drove separately so that he could continue on to work afterwards, and when Jasper and I got to the church, Lucy was already waiting. We had a nice lunch–barbeque, though almost no one wanted the cornbread and Jasper was the only person courageous enough to try the cake! When we got home I wrapped up individual pieces of cornbread and put them in the freezer so that Lucy and I will have them for future meals. While I was at the lunch, I got a text from the mother of one of my students, wanting to know if I would like to attend the dress rehearsal of “The Little Mermaid,” which our local youth theater is putting on starting tomorrow. Her son plays the role of “Scuttle” the seagull. Well, of course I said yes. I love going to plays! So I ate an early supper and then drove up to the theater. I enjoyed myself so much! Those kids did such a great job and put on a really professional show. A few of them were also really outstanding vocalists! And I found out that my student was not the only kid I knew in the show. There were several other past students of mine. I have to admit, though, that the seagull was outstanding! Getting to go see that was such a treat. It brought back so many happy memories of the plays that I was involved in during my high school years.